Check out our Popular Reading Collection! Over the summer, we added 20 new titles to our Popular Reading Collection. These include novels of suspense, love and mystery, some humor and a few biographies. If you are new to this collection, you can find bout 200 books of current popular books at the front of the library in this collection. Look for the Starburst sign! 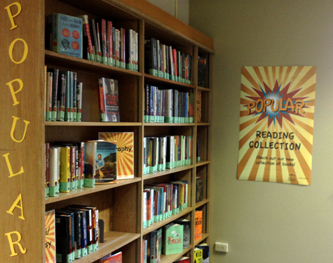 This entry was posted in Focus on New Services, Popular Reading Collection. Bookmark the permalink.